I'm growing rather fond of this bar. Verdant - Safety Flares 5.20 Kegged in some way. A fabulous Simcoe singl-hop Pale Ale. Citrus and pine. Quite apart from the taste, it smells fantastic. Pressure Drop - Dreamlife 4.60 Keg. Soft and fluffy and peachy. Unusually quiet in here on a cold and bleak Thursday evening. 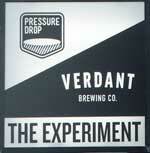 Verdant - The Most Effective Way 5.00 From key-keg. A spectacularly murky Pale Ale. A melon and citrus hop smoothie. Pressure Drop - Lorikeet 6.80 From key-keg. A golden, murky, bitter and fruity NEIPA. Verdant - Your Limitation. It's Only Your Imagination 8.00 From a key-keg. Golden murk. Massively hopped. Simcoe, Loral and Chinook. Very smooth. Every table taken on a Thursday evening, but people are here for the long haul and there is not the constant throughput of customers I have seen on weekend visits. Ten beers available; five from each brewery. Pressure Drop - Alive and Well 3.60 Key-keg. Murky gold. A session-strength hopfest. Verdant - Photon Trails: Amarillo Ekuanot Azacca 5.20 Key-keg. Murky gold. Soft mouthfeel. Great hop blend. Although this bar is not crowded tonight, we have ourselves become quite a big group and fill a significant space. Verdant - Don’t Fear the Ferryman BA 10.00 From key-keg. A truly superb, bourbon barrel-aged Imperial Stout. Pressure Drop - Partial Pressures 7.40 Served from key-keg. Just as I think I have had enough of the NEIPAs I find a fantastic one; like this one. It would be five stars on another day I’m sure. Verdant - People, Money, Space, Time 3.80 From key-keg. A murky, golden APA. A steady throughflow of customers during my own short time here – a pub/brewery crawl has already developed in this area. Verdant - Neal Gets Things Done 6.50 From key-keg. As murky as a village duckpond, yet somehow wonderfully fresh and hoppy and lovely. Mid to late-evening visit. Busy; the secret is well and truly out about this place. Pressure Drop - Hazy Coalition 6.80 For the time being at least, I am still loving these hazy, hoppy beers that everyone seems to be brewing. This is a murky yellow/gold liquid. A massive mouthful of hops, with Azacca, El Dorado and Citra for a full-on experience. Starts pineapple then becomes bitter. Temperature, condition and carbonation all seem perfect from key-keg. By miles the best beer of the day so far and probably of the year so far in fact. (The 'coalition' is with Boxcar Brewery). Pressure Drop - Float On 6.50 Cloudy gold from key-keg. Juicy, fruity excellence. In your face Centennial, Citra and AV635 hop mix. Verdant - Majestic Highway 8.00 A simply huge beer, from key-keg. 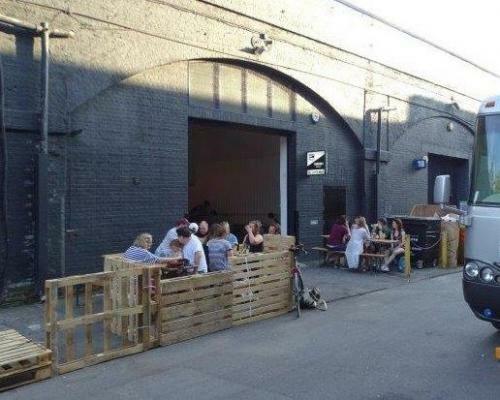 Today is day two of the new life of this railway arch as a craft beer bar. There is a fifty-fifty split of keg, or more likely key-keg, beers from Pressure Drop and Verdant breweries, plus further offerings in can and bottle. No cash taken at the bar. Pressure Drop - Transparent Things 5.80 Golden and murky with a soft mouthfeel and low carbonation. Juicy fruit, with a gentle bitterness. Mango and peach. Lovely. Verdant - Even Sharks Need Water 6.50 More golden murkiness. Juicy fruit – melon and citrus. Pressure Drop - Parachute 5.50 Pale golden murk. Ekuanot and Citra hops and a harder mouthfeel than many in this style. Verdant - Howl 7.60 A Double IPA. Very smooth. Strong and fruity (stone fruits – plums and peaches). All in the group are impressed with their visit here: Very good beer, a sparkling new brewery kit, and nice people. Pressure Drop - Pale Fire – Mosaic Citra 5.20 In bottled form. The brewers are rightly proud of this hoppy brew. Pressure Drop - Wu Gang Chops – The Tree 4.10 In bottled form. This beer has an unusual, earthy smell. It is a wheat beer, flavoured with herbs. Weird, but very nice. Pressure Drop - Stokey Brown 5.00 Not Tried Cask version available, I did not try it. 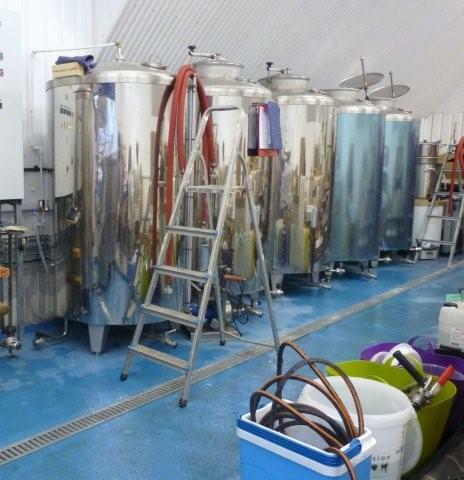 Pressure Drop brewery was established in Stoke Newington in 2012, with the first beer sold in January 2013. 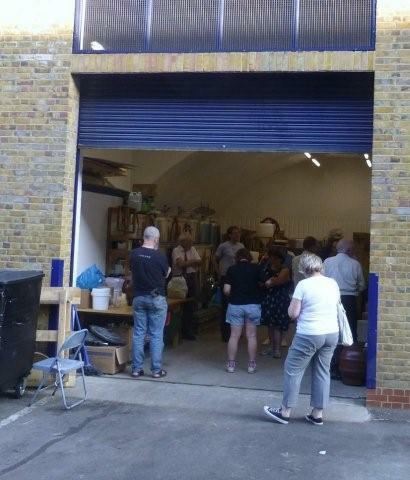 The brewery moved to these larger premises in Hackney in March 2013. Here, it occupied a large railway arch behind Tesco’s, in the centre of Hackney. Whilst located here, the brewery had a production capacity of five barrels and produced cask, keg and bottled beers. In 2017, Pressure Drop upsized again to very much larger premises at Tottenham Hale and this railway arch stood unused for a while. In July 2018 it re-opened as The Experiment, a bar set up as a joint venture between Pressure Drop and Verdant Breweries. We have visited this pub 8 times, seen 21 different beers and tried 20 of them.